Firewalls are designed to provide access control. Although there is risk associated with any access, by limiting what access is permitted the risk is limited and understood and can be evaluated against business need to effectively justify the risk. However, poor firewall management defeats this purpose by ineffectively controlling access and limiting visibility into what access is actually permitted; poor management also increases the cost associated with security management. The result of poor management is a firewall policy with unnecessary rules that result in excessive complexity, overly permissive access, unnecessary risk and performance degradation, all of which lead to higher costs that can be avoided. These problems can be addressed with both short-term and long-term activities to clean up the firewall now and prevent this situation from returning. 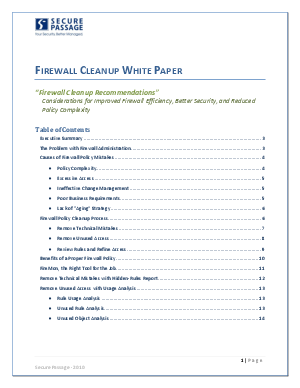 This paper discusses the implications of firewall policy complexity, why it remains a problem today and how to resolve it.